1974-75  CSO jackline plant. It was left in place in 1974-75. NOTE: The PCO jackline plant, which Johnson sometimes refers to as the "upper" jackline plant, was located on the left (south) side of the road as you're going up. The CSO or "lower" jackline plant was on the right (north) side of the road near the famous CSO No. 4 oil well. Jackline plants, aka jackplants, came into vogue in California in the 1890s. They were a cheap way to run multiple oil rigs from a single engine. A steam or gas engine drove a central shaft, to which were attached eccentric (literally "off center") wheels. From one of the wheels, several cables fanned out to individual oil well pumps, and the wheels jerked the cables back and forth. More info. Ed. 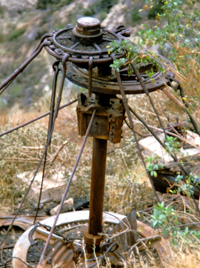 I (Greg Johnson) spent a lot of time in Pico and Wiley Canyons in 1974 and 1975, removing some of the old steam and gas engines that the scrappers had not taken when Standard Oil Co. sold the remaining steel and iron around 1970. (Resident foreman) Frenchy Lagasse was very helpful in showing us where the old iron could still be found on the site. We also discovered much more that he did not know about. Together with four or five other old engine collectors, I spent many weekends (perhaps 30 to 40 trips) with trucks, tractors and winches, saving what most certainly would have been lost. All of the easily removed iron had been taken by the scrappers, so we ended up only with the hard-to-get to pieces. We were able to buy any remaining antique equipment in Pico and Wiley canyons from Standard Oil through a friend who was involved in the oil business. The original purchase deal was with me and a friend named Terry Hathaway. Standard wanted only a token fee for the items, to make for a legal sale. We paid a total of $1 plus 6 cents sales tax for anything and everything we wanted to preserve from the canyons. Terry's family was in the oil production business in Santa Fe Springs and had contacts with Standard. We had free run of the canyons with no oversight from Standard, other than Frenchy showing us around on the first day. Our small group saved much of the mechanical history of Pico and Wiley canyons. All probably would have been sent to the scrap yard or buried otherwise. I think the timing of our work there could only have been better if we had beaten the scrappers to the easy iron a few years earlier. The two original jackline plants in Pico Canyon were mostly intact in 1974 when I was there. A brush fire had burned all of the wooden parts and the buildings, but the tin lay where it had fallen after the wood framework burned. The big iron and steel parts remained. One plant was lower in the canyon on CSO Hill and was powered by a Union Tool Co. gas engine. Standard Oil had bulldozed a road over the top of the plant, with only the side of the cylinder from the engine showing just below the road. The jackline plant was still standing, with some cables still attached. The new road was right on top of where the engine was located. The bulldozers had pushed the flywheels and half of the engine frame and destroyed the engine. The half that had been pushed out was not to be found. The other half was still in the ground, with the timing gear sticking out of the dirt just below the road. We dug it out and saved the pieces that remained. The engine was a 35- or 40-HP Union Tool gas engine made in Torrance, Calif. I think the remaining engine parts were eventually scrapped, as there were no other identical engines requiring those parts. We did take the clutch from the engine. It was restored by Terry and is now on a Union Tool engine on display at the Antique Gas & Steam Engine Museum in Vista, Calif. Terry donated that engine to the museum. The jackline plant’s gears and vertical shaft were still in place when we left. We did not take any jackline plant parts from this area. The other jackline plant was near the top of PCO Hill, about 75 feet below a large, flat area. The jackline plant and engine were in their original location and were still bolted down to the concrete when we found them. It was a tough drive to get to the location with big equipment. It was in terrible condition after being last run around 1937. The tin of the building was lying on the engine and jack plant. Over the years, rains had caused the soil to move down-slope and bury the engine about halfway up the 7-foot-diameter flywheels. We dug the engine out, disassembled the major parts, and winched them and the jackline plant up to the flat area. The engine was a model-3 Klein made by National Transit of Oil City, Penn. Manufactured around 1899, it was rated at 35 HP. It had a Standard Oil production number stamped on the cylinder. The engine has a 12-inch bore, 24-inch stroke, single horizontal cylinder, and used natural gas out of the wells for fuel. One interesting fact is that this is the only surviving Klein engine found outside of West Virginia, Ohio or Pennsylvania. In those states, this engine was used to pump crude oil through pipe lines, never to pump oil from the ground. It is also the only surviving Klein of that size and style known. I ended up owning the engine and restored it after several years of hard work. I had it on display at the Antique Gas & Steam Engine Museum in Vista. It is now in the Coolspring Power Museum in Coolspring, Penn. Photos of the engine from Pico are not on their website, although they used to have a photo or two of it arriving at the museum. I am an active member of that museum and travel there every year to run the engines. The PCO jackline plant was saved by a friend, but it was in very poor condition and was finally scrapped. 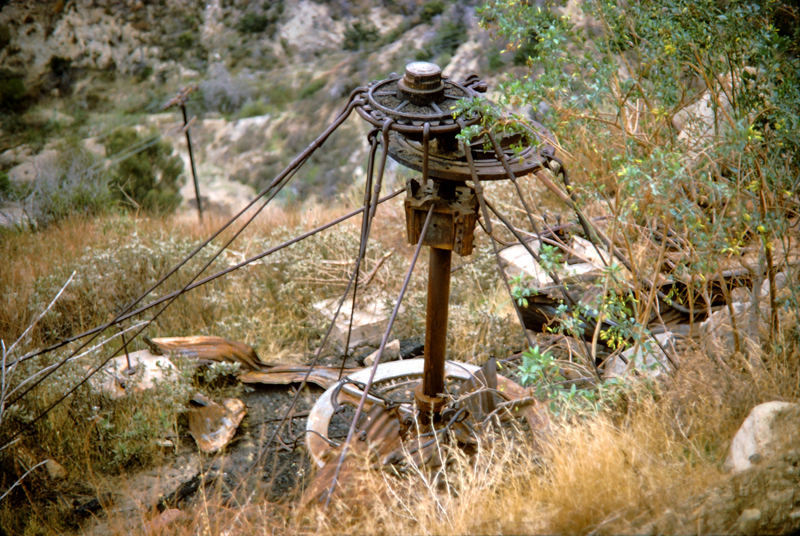 The gas engine and jackline plant near the Pico 4 well site now were never used in Pico Canyon. They were last used in the 1960s on Court Street in downtown Los Angeles and were owned by the Manley Oil Co. Ken Manley donated them to Travel Town in Griffith Park in Los Angeles, where they sat for many years. Travel Town decided to get rid of them, and they somehow ended up at Pico. The engine is a 25-HP Commercial made in Los Angeles circa 1912. There was a 20-HP Union Tool gas engine that had pumped a single well (a standard rig) south of the main road and partway up the hill. We pulled it out and took it to Santa Fe Springs for restoration. Frenchy decided he wanted it back, so we returned it, although we had legally purchased it from Standard. It was missing one flywheel at that time. It appears to be in much worse condition now. I did not learn why Frenchy wanted the engine returned. It would have required a major expense to cast and machine a new flywheel and the other missing parts to make it run. The engine is worth restoring and saving, but it will probably be exposed to the elements and rust next to the school house, unless an effort is made to keep it under cover and dry. It would have been properly restored, with all the missing parts remanufactured, if we had kept it. The photographs (of the salvage operations) were shot by Grant Burns and by me, and they were slides (color transparencies). Grant died a few years ago and his wife gave me his slides. I recently had them digitized. I am in some of them, usually wearing a black felt hat and wire-rim glasses. I had long, black hair then. * Note: This story was compiled by Stan Walker from many e-mails he received from Greg Johnson, who reviewed and approved the story. GB0268: 9600 dpi jpeg from digital image (originally color transparency).